I see a lot of indie authors begging for reviews (and feeling stupid for it). I hate begging for stuff. I hate asking friends and families for reviews, giving out ARC copies, and then knowing specifically who should be but isn’t reviewing my books. Trust me, I’ve been there. But I stopped that nonsense years ago, after my first book. The first book is the one you worked the hardest on, and you’ll probably try and leverage your existing platform and relationship to get reviews up. You need real reviews from readers of your genre. Your friends, family and co-workers might not “get” your book if they don’t read in the genre, and they might feel uncomfortable reviewing it. 3… Plus, Amazon sometimes deletes reviews if it came from someone you have any contact with. If you’re working too hard trying to harass friends or family into reviewing your book, stop. 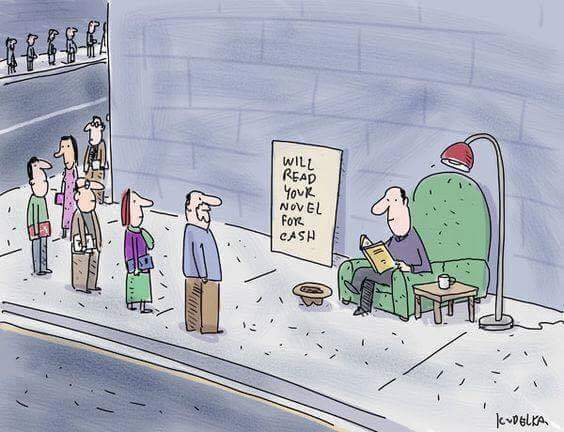 Focus on getting your book out to more strangers. You can email hundreds of book reviewers in your genre, if you have a great email and get their attention, and give away a lot of copies to your book to active readers in your genre. If your book cover doesn’t look professional, or the story didn’t hook them in the first few pages, then you’re asking them to review a book they don’t want to read. Then it becomes a chore and a favor… and not an easy one. If someone is doing you a big favor, find a way to help them out as well – though really, you shouldn’t ask for favors. Maybe the stress and pressure makes them avoid reading or taking action. Maybe they’ve never written a book review before and don’t know how to start. Maybe you need to make a simple template for them to copy, or let them know that a short review of just a few words is good enough. It’s easy to review books that you loved or hated. You don’t need to look for things to say, you know why you like/didn’t like it. It’s much harder to review books that are meh. Maybe it’s not really bad, maybe it’s even pretty decent. A “good effort.” But they still had to force themselves to get through, and now that it’s finished they can’t really remember what it’s about. The plot wasn’t concise or well organized. The characters weren’t deep enough or didn’t resonate. The conflict didn’t intrigue them. A) Their expectations were shattered – it was better than they thought it would be. B) They expected more – it wasn’t as good as they expected it to be. So, how do you get more books reviews? Yes, you should keep asking and working for reviews, but don’t beg. Find at least a thousand readers in your genre, offer them a free book. Get 200 of them to download and read it. If 20 of them loved it, they’ll leave a review. If you don’t get any reviews and are sure people are actually reading it, you probably have a quality problem. In which case, take it as an indication to improve your writing. When your writing grabs by the throat from page one and leads readers on an amazing adventure, they’ll be excited to share and review your book for you.